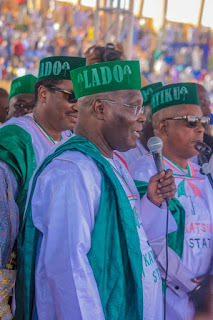 Peoples Democratic Party presidential candidate in the February 16, 2019 General Elections, Atiku Abubakar, on Thursday in Katsina said late Major General Shehu Musa Yar ’Adua , anointed him for the position of Nigeria ’s President since 1993. The PDP presidential candidate, who spoke in Hausa, said, “Late Shehu Yar ’Adua had anointed me as Nigeria’s President since 1993. The complex nature of Nigeria’s politics would not make this to become a reality.